Welcome to Market Update Q3 2017, giving you an up-to-date view of the office, investment & development market west of the West End. Included in this issue: affordable housing, office supply, current rents, office take-up review in Kensington & Chelsea. Development Pipeline in West London. Office take in this Market Update Q3 2017 up so far this year in Hammersmith & Fulham is at 246,000 sq ft – well ahead of the total for 2016 (201,000 sq ft) with Q4 still to go. This quarter saw the highest take up in 2 years seeing 104,000 sq ft primarily due to the increased supply available and WeWork’s leasing of the 53,000 sq ft ground to 3rd floors of 12 Hammersmith Grove W6. Q3 take-up in Royal Borough of Kensington & Chelsea was also the highest of the year at 62,000 sq ft. Conversely Chiswick is suffering lower take-up as tenants appear to have opted for White City W12 over Chiswick Park W4 but at Helical Bar’s refurbished Power Road Studios W4, Intelligent Media, a global media monitoring service for the entertainment industries, has taken 2,425 sq ft at a rent of approximately £43 per sq ft which sets a new benchmark for this Chiswick scheme and a further 5,900 sq ft is also under offer. Helical have comprehensively refurbished Studio 1, creating a campus entrance on to Power Road and warehouse style office space which is offered on flexible lease lengths. In addition to WeWork (co-working) other tenants that relocated to west of the West End this quarter include Creative Artists Agency (the sports and entertainment agency) taking 26,000 sq ft at 12 Hammersmith Grove W6, Mars (confectionery) and Sasol (chemicals and energy) who took 30,000 sq ft and 15,000 sq ft at 4 Kingdom Street Paddington Basin, W2. Rents range from £55 to £59 per sq ft at 12 Hammersmith Grove W6 from the ground floor to the top floor and the average rent at 4 Kingdom Street W2 is £71 per sq ft. Also in Hammersmith MIH Jeans (fashion) and Eidsgaard (yacht design) joined Damien Hirst at Thames Wharf Studios Rainville Road W6 (home to The River Café), where rents range from £47 to £52.50 per sq ft.
At White City Place W12, One Web took 30,000 sq ft at the Westworks Building at around £50 per sq ft. One Web are intending to launch a constellation of 900 satellites 750 miles above Earth to beam in internet access. 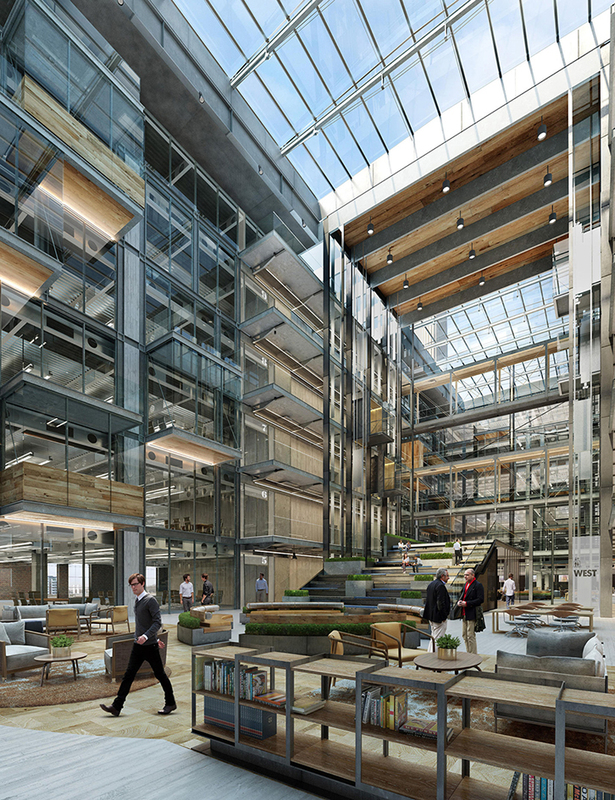 White City at £50 per sq ft.
On 28th September Axa and Bell Hammer launched the new 114,500 ft Foundry office building, the central building at Assembly London, 77 Fulham Palace Road, Hammersmith. Foundry has floor plates of 23,000 sq ft, a roof terrace, squash courts and Brompton’s new cycle hire scheme where Brompton bicycles are available from the on-site lockers that can be hired for £3.50 a day. 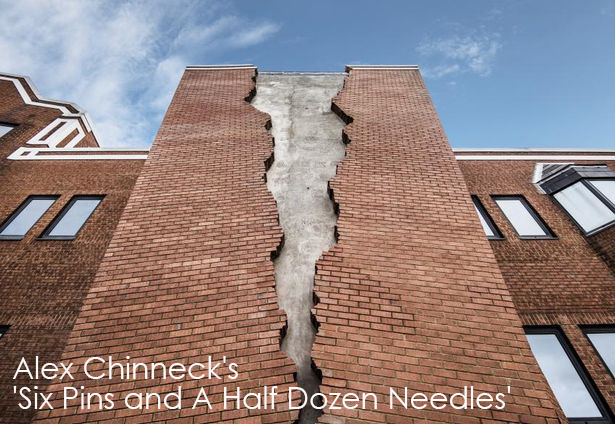 At the front of the Assembly is sculptor, Alex Chinneck’s new piece ‘Six Pins and A Half Dozen Needles‘ The surrealist installation reaches a height of 20 m, and weighs 10 tonnes. The installation is designed to appear as though the building’s red brick façade has cracked in half. Chinneck intended the split to resemble a page ripped from a book. Frost Meadowcroft has researched the Royal Borough of Kensington & Chelsea take-up over the last two & a half years (from Q1 2015 to Q3 2017). In terms of the amount of supply taken, the energy, mining, finance and fashion industries accounted for about…. As well as the 500,000 sq ft pre-let to Apple last year 40,000 sq ft will also be made available on top of the Boiler House at Battersea Power Station. This space had previously been earmarked as a hotel but architects WilkinsonEyre are now designing 2 floors of offices and a members club overlooking the central atrium. n Q3 the Mayor published its Supplementary Planning Guidance (SPG) covering affordable housing and viability. This introduced a threshold approach to viability designed to incentivise developers to deliver 35% or more affordable housing in their schemes, by not requiring them to submit viability assessments and is therefore called ‘the fast track route’. The SPG underlines that where Boroughs adopt different approaches to delivering a higher average percentage of affordable housing (without public subsidy), their local approach can continue to apply. When a scheme does not meet the 35% threshold….